For the convenience of our patients we do offer 100% financing through Care Credit, Med Loan Financing, Prosper Healthcare Lending and Medical Financing. Our office gladly accepts Cash, Check, Visa, MasterCard, and Discover. With over $5 Billion funded and over 300,000 loan inquiries serviced through their lenders, this is a name and a program you can trust. 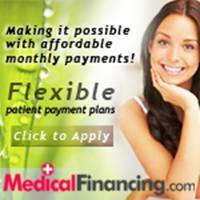 MedicalFinancing.com is proud to offer patient financing options for all your elective surgery procedures. We have been helping patients obtain financing for procedures such as breast augmentation, tattoo removal, gastric bypass,invitro fertilization, hair loss replacement and much more. With Financing up to $20,000 and convenient repayment plans, you can feel comfortable knowing your surgery costs will be covered. Apply today and see how MedicalFinancing.com can make a difference.